Jinx Schwartz's Water Writes: Say hello to Marilyn Meredith! Say hello to Marilyn Meredith! 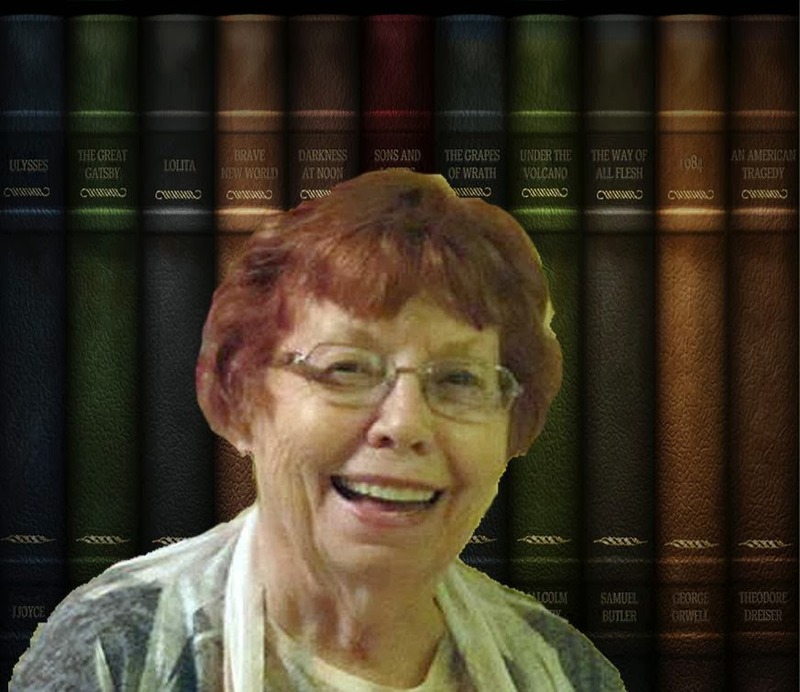 My guest today is one of my favorite people, prolific author Marilyn Meredith. She has more than thirty published novels to her credit, including the award-winning Deputy Tempe Crabtree mystery series. She borrows a lot from where she lives in the Southern Sierra for the town of Bear Creek and the surrounding area, including the nearby Tule River Indian Reservation. She does like to remind everyone that she is writing fiction. Marilyn is a member of EPIC, three chapters of Sisters in Crime, Mystery Writers of America, and on the board of the Public Safety Writers of America. Today she tells us abut her newest Crabtree mystery, and how such an otherwise sweet person is so in entranced with horror! When my children were little and my husband was overseas, if a horror movie was on television, everyone piled into my bed to watch, which meant between 3 to 5 kids joined me. Because the movies were scary, often the whole bunch spent the rest of the night with me. Back during that time period, the horror movies that were on TV were pretty campy by today’s standards—Frankenstein, Dracula, and other mad scientist tales. But once in a while there was a really good (meaning really scary) like the Spiral Staircase. That was far scarier than any monster movie. I’ve continued to enjoy watching scary movies, but I don’t like the slash and gash types that are more blood and gore than storytelling, or the ones about the group of young people stranded in a house, on an island, in a campground and are killed one by one. I loved the Woman in White and other such movies set back in some early time period with lots of fog and atmosphere. The best horror films are the ones that seem somewhat plausible—the latest one being The Conjuring. One of the scariest I can’t remember the name of, but it was about some people traveling in a motor home that were being pursued by witches. I still get goose bumps when I think about that one. I’ve read most of Stephen King’s books and the one I though the scariest was It. The movie didn’t come close as far as the shiver factor is concerned. (That seems to be the problem with most of the movies made from his books though The Shining was scary, just not as much as the book. That gives you a pretty good idea that I do love scary movies and books and that’s probably why I like to put the scare factor into my mysteries. 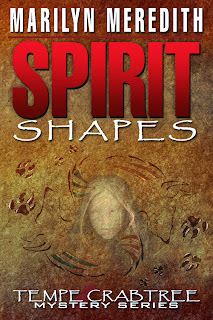 If you like a bit of that too, do try Spirit Shapes: Ghost hunters stumble upon a murdered teen in a haunted house. Deputy Temp Crabtree's investigation pulls her into a whirlwind of restless spirits, good and evil, intertwined with the past and present, and demons and angels at war. This has been a great tour Marilyn. Enjoyed every single stop of it. Already loved Tempe and now I feel I know so much more about you too. As to horror movies, that would be me hiding under the bed. Can not watch them. I never saw the Wizard of Oz all the way through until I was sixteen because I was scared of the witch. That's how bad I am. And I let out a blood curdling scream in a theater at Play Misty For Me. Hi, there Kate! Yep, this is the end, and I still do love horror movies--but I must say I like them best when I watch them at home. My grandsons when they were 3 and 4 watched The Wizard of Ox up until the flying monkeys appeared, then they ran screaming from the room. Hey, Jinx, thanks so much for being the last stop on my tour for Spirit Shapes. Wish I could see you again--I remember how much fun we had kibitzing at the cocktail party at Epicon in Nevada. It's been awhile. I don't like being scared, so I don't ever watch horror movies if I can help it. the Haunted Mansion at Disneyland is about as much as I want to be scared. However, I love ghost stories. Took the Ghost Walk in San Juan Capistrano last Friday night--interesting and not scary. And I wrote a book about a ghost. 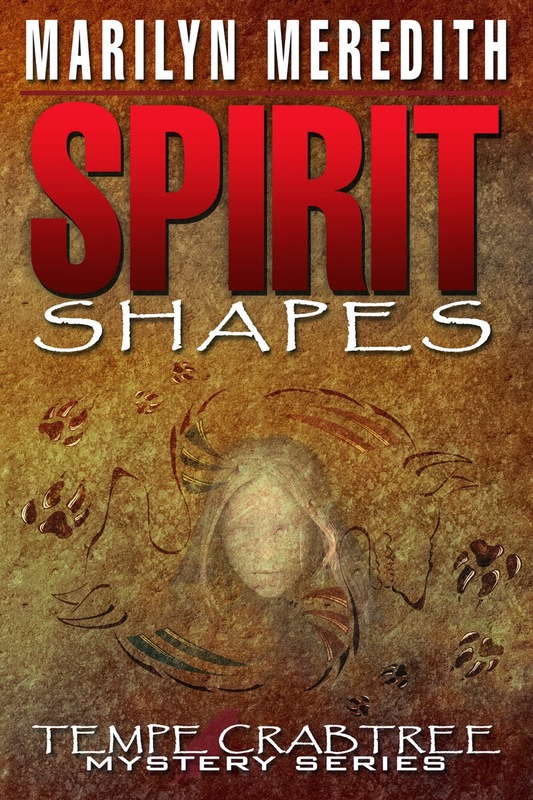 Spirit shapes is really fun because it has Tempe Crabtree--and me! Hi, Lorna, I think the Haunted Mansion at Disneyland is my favorite there. When I used to go, I always headed there first. Paul, I just rented The Spiral Staircase, but I'll have to add the others to my Netflix list. Of course I've seen them all before, but it's fun/scary to see them again. Marilyn, I'm constantly in awe of you. So many published novels, and you always seem to be running around promoting in person, and also doing so online! Loved the blog post, because it brought back memories for me. I loved TV shows like "The Sixth Sense" and "Night Gallery". Night Gallery had one about a guy who hired a man to put an earwig bug in his lovers husband ear. The man mixed up the rooms and put the bug in his. He survived the bug eating all the way through his brian only to learn the bug had babies in his head. It was irony at its best! To this day I always sleep with my blanket covering my ears. We had Friday Fright Night with Elvira hosting. I never missed it! I think I was the only one in my family, who cried for monster Frankenstein. Vincent Price was another favorite in the movie "The Fly" and Hitchcock's "The Birds" and "Psycho" TERRIFIED me! They don't make thrillers like this anymore! I hate all the blood and guts. Thanks for reminding me of scary nights from my past! It is after all Halloween! Diane, I loved all the shows you mentioned and I forgot about Elvira and her Fright Night. I watched that too. Morgan, you do as much as me and more! Hello everyone, and thanks for visiting. And Marilyn, you can unpack your bags and take a well-deserved break. Knowing you, however, it won't be for long. Best of luck on your latest book!